Take a look at this square hay feeder. I keep wanting to call it a square 'hay ring'! Maybe I'll just keep calling it that instead of trying to call it a square hay feeder. Anyway, it's great. It's built extremely well, great craftsmanship, nice and heavy, but not too heavy. The cows left little waste behind after their first try with eating a nice bale of alfalfa, and I was happy to see that. If you'd like one of these hay......... feeders, check out this link for Avery Welding in Pennington, Texas. Brian and Vicky Avery are nice folks and the Avery's have been welding reliable farm and ranch hay rings, gates, and more for a few generations and it shows in the quality products they fabricate. I'll be posting a photo of the cows feeding at the 'ring' -- can't help it, ring just seems to be the right word -- after I get in a few more of them. Right now, all the cows mob this one, and it's pretty impossible to get a good photo of the cow's feeding. I'm putting some higher grade alfalfa in this ring, and it was a good choice, as it has done it's job of containing waste and resolving the dilemma of putting a square bale in a round ring and providing good access to the hay for a maximum amount of hungry cows. As British White breeders we daily face lack of acceptance in the mainstream Beef Industry as our cattle are white hided and haven't been the subject of University studies. We are likely perceived by some in the beef industry as "chasing" a goal that is unwanted or unnecessary as there are some closed-minded industry perceptions about what works and what doesn't when it comes to beef breeds and beef production, and know-it-alls such as described in the article excerpt below, think they. . . know it all. 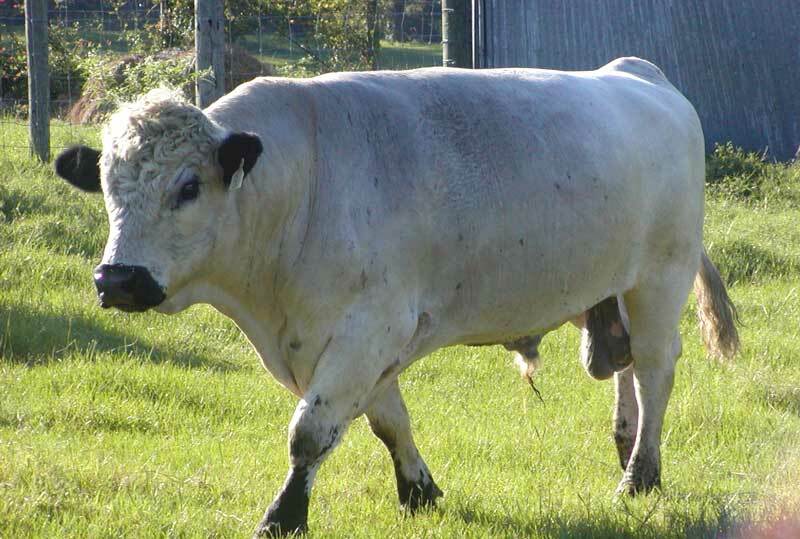 As British White breeders we know we have cattle with excellent maternal traits, fertility, hardiness in wide ranging climates, calving life longevity upwards of twenty years, well set udders that withstand the rigors of years of suckling calves without "falling down", excellent carcass quality, genectically gentle dispositions, and more. But, we do need to pursue or "chase" documenting those outstanding qualities through some or all of the following -- Conscientious recording of growth trait data such as weaning weights and yearling weights; establishing Ultrasound Guidelines for the breed and pursuing the capture of yearling bull and heifer carcass ultrasound data by certified technicians; adding to the growing pool of DNA data for the currently identified markers for Marbling and Tenderness; establishing an annual Feedlot test for crossbred and purebred feeder steers and heifers; seeking out Bull Performance tests in our local areas for our bull candidates. The following is an excerpt from "CAB Cattle Update: The “C” word". Click the Title link above for the text of the whole article. ". . . It’s usually better to lead than chase cattle, but one calorie-counting authority estimates a moderate walk in non-strenuous cattle chasing burns 238 calories per hour for a 150-pound person. At that rate, it would take more than three hours to walk off a Big Mac. You may be thinking of another idiom: cut to the chase, or get to the point. Some beef industry pundits proclaim ideal pathways for all logical producers. Dissenters are deluded and must be “chasing” something. Some intense cattlemen lash out with the “c” word. They may include their goals and aspirations, which never include so much as a stray glance at what they own as a senseless pursuit. However, those who see things differently are condescendingly lamented as chasing an illusive and impractical dream. The most chased-after end seems to be genetic selection that would add value to the beef we sell to consumers. One might as well chase ping-pong balls or a cure for cancer. Critics include the range of those who see any attention to post-weaning traits as silly, to those who see it as a noble, if impossible dream. When the rhetoric starts flying, a critic may deplore “chasing” something or other. He will usually balance that by pointing out the further errors of “ignoring” and “sacrificing” other things. The implication is that those slighted pursuits are at least as worthy as that being chased after, but the chaser is too blind to see. It all boils down to bias in the critic. Look at their cattle, their field of study, perhaps their life’s work. They may not realize their bias or the condescending nature of their chase to enlighten others. Or, they could be using loaded words in a calculated manner to sell something. . ."
Southeast Texas just had a few days of temperatures reaching the freezing point, seems unusual for this time of year, but fortunately no pipes burst and the ice in the troughs was minimal, but then lately I've got water leaks on what seems a daily basis, that's surely as effective at preventing pipes from bursting as setting a faucet on drip! I've been feeding alfalfa as a supplement for my British Whites some years now, but it was only this past winter that had me wishing for square hay feeders. Prior to last winter I fed the alfalfa in flakes on top of their round bales of coastal and that worked fairly well. But last winter saw a shortage of hay and the coastal I had lined up didn't work out. With greed running rampant in the hay business, the price of good coastal hay per bale plus delivery to my place was equal to and sometimes more than the cost of shipping in cow grade alfalfa from Nebraska. Thus I chose to ship in nothing but alfalfa last winter, and my cattle thrived like no other winter. Shipping costs ran higher this year, but the total out of pocket cost per ton for Dairy Quality alfalfa was still equal to or less than buying a decent quality 20% protein grain by the ton in 50 lb bags. So this year I'm feeding coastal baled from my pastures as well as crabgrass hay out of Louisiana, and providing alfalfa as their supplemental protein, but feeding it by the bale rather than topping round bales of regular hay forage with the alfalfa. As you can see from the photo , the big alfalfa squares barely fit into my rings and I have to bust up that middle once they've eaten down enough of it to make it doable -- to make the hay accessible all around the feeding area of the ring (also, these girls are getting alfalfa from last summer that went through a 20 plus inch flood, thus the dark bottom side that you see!). I'm hoping a welding shop in Pennington will be able to make some square feeders for me. I've looked around online and most of what I find is very very heavy square hay feeders from up North that look more functional as stationary objects in a feedlot, which will not work here. I try to move the haying area all around my pastures to avoid excessive manure build up, and follow up with busting up the manure with a drag harrow. In the second photo you can see the adjoining pasture where my big herd is being fed and that it's time to move their hay rings to fresh ground. I try not to feed more than twice without moving the rings to clean ground, and so really heavy feeders aren't practical. The past days have been busy and filled with much of the typical demands of a cattle ranch, with some llama (the one in front in the pic) and cat crisis added in. I lost a cat to a snake bite yesterday, and it was the second snake bite suffered by a cat in the past couple of weeks, the first one, Leopold, did survive -- it's got me wondering if some odd, insidious, northern snake that kind of likes moving around in the fall weather may have made the trip from up North with a load of alfalfa. One of my llamas is just acting puny, I can't see any obvious wound, but then she's covered in several inches of hair over the majority of her body. She waits for me to bring her food and water a few times each day, and seems to be getting a bit better. I haven't ruled out snake bite for the cause of her decline, it's a good possibility under the circumstances. Tonight, I got around to watching Primetime from a few days back, the main story was on Mel Gibson's newest movie, Apocalypto. It looks to be a very good movie, and the premise I find fascinating, the rise and fall of a powerful culture perhaps via their own inadvertent self-destruction due to greed and wish to control, to have, to be, more and more. Ultimately, this led to a quite lost and destitute Mayan culture in the modern day. Of course, the point was made that perhaps the Bush Administration and the war in Iraq is reflective of the waste of human life and other natural resources that led to the apocalyptic end of the Mayan culture. While to some extent I can understand Gibson's wish to correlate current USA events and attitudes with the historical rise and fall of powerful cultures and nations, there's ample bloody fingerprints from prior administrations throughout US history that have had less basis and more loss of life than current events -- what struck me as most important from this Primetime coverage of the movie Apocalypto was the footage of Mayan descendants in Mexico and Guatemala today who live in poverty. An ancient and mighty people who when covered by Primetime reporters find their best stories in a young Mayan boy who sniffs glue and lives in a garbage dump; and a 'single' Mom who prepares meals over a fire and weeps and tells them her life is striving to somehow make a better future for her children. How will those children ever have a shot at a better future? Education is the key to better futures in the USA, and certainly a lot of hard work is vital as well. But the modern Mayan culture presented as the norm during the filming of this movie was distinctly lacking in any indication of options such as education or industry that would provide a way out, a way up, for one person, much less the modern day Mayan culture as a whole. We also learn via this Primetime coverage that Mel Gibson's last movie has made over a BILLION dollars -- that's pretty awesome. The Apocalypto may well make more, they certainly made use of lots of native 'actors' and so there isn't a big budget for greedy USA actors. So, given the horrid conditions Mel Gibson described very well himself, and Primetime covered so colorfully -- why wouldn't Mr. Gibson himself already have a University being built in either Guatemala or Mexico for the modern day Mayan descendants? A BILLION dollars from his last movie and more to come ----- I think that would build a University (I doubt they'd object to cinder block walls or lack of 'really cool' stuff necessary in the USA) and pay some profs for a couple of years, and truly change some lives in this lost, but once mighty, culture. A failing of Hollywood Democrats is their own lack of example. They make more money than any average American can ever conceive, even some governmental bodies, use their popularity as a political tool, but be assured they don't put themselves at risk financially, they most assuredly have the best of CPA's or Financial Planners to assist them in using every conceivable avenue of tax savings. So what's the point of this on a Cattle Blog? :) Well, the British White cattle breed is somewhat of a lost culture if you will. It is up to the breeders of this special bovine to continue to fight to bring it back to the revered status it held in ancient days. We will never know what events occurred that brought this special breed from immortalization in ancient oral tales to the small population to be found in the 19th century, any more than we can really know what caused the destruction of the Mayan culture. But we can work hard to educate those around us about the British White breed. And we can make better efforts to record their growth traits, their ultrasound carcass data, their DNA, and their many other desirable traits that aren't perhaps as easily quantifiable. This isn't necessarily a normal moment here at the ranch, but with Donny, my Arabian Horse, anything is possible. I'm thinking he anticipates some rain perhaps and wants a roof over his head close to humans! But, in trying to capture this picture, I realized he was both enjoying the carport and the massive amount of live oak acorns blown in by the wind for his enjoyment in a nice 'parking' spot. I scooted him out the gate in short order where he's got ample grass still to graze, it really wouldn't do for him to get a belly full of acorns, he might founder on them.....I swear he can founder on most anything - except grass and alfalfa hay! Donny came to the ranch a few years back, he foundered immediately his first spring on the fresh grass! Turns out it's A&M's opinion that he was an old founder horse.........so that explains the really good deal I got when I bought him. The years since then have been difficult and draining and at times had me at what I thought was the end of my endurance, much less his. Regardless, we both weathered it through (his farrier says he's the example he tells others about of a phenomenal horse and owner that has successfully survived the most severe of rotations from laminitis) and he's a fixture here at the ranch, and in many ways is responsible for my complete embracement of a natural, grassfed approach to raising my British White cattle. It would kill him if he found his way to a pasture with grain in a feed bin, or a lick tub with weird protein sources added, or just snuck into the barn and found a feed bag that smelled good and looked like a good candidate for ripping into! I new I had to make it safe for Donny to live with some ease, for me to live with some ease from worry about him. A Grassfed approach to raising my cattle satisfied, resolved the situation. Alfalfa suits him fine, he never has any problems hanging with the cows and sharing their alfalfa, and of course I always watch my grass hay quality for anything that may hurt him. The only problems I encounter with Donny running with the cows.........he becomes their authority figure! So he's by himself for the next few weeks, my heifers are in my Northwest Middle pasture and it has lots of pot holes towards a natural ravine and I don't like the risk of having him there. He can't run with the fall calvers because he might try to start directing my new baby calves around, and that won't do. So for now he's by himself for a bit and I leave the gate open to the grounds of the house off and on, he's a really good lawn mower! But the massive acorns that have dropped from the live oak tress around the house the past couple of weeks create some limits to how often he can come in and browse around the shrubs and hang out in the carport! He particularly likes to do a good trimming to the purple pampas grass -- it's surely good for it! Right? British White Cattle - They REALLY are more GENTLE than Other Breeds! Too often some visitors to my ranch comment that their calm character is surely due to the "time I must spend with them". As Breeders of this very special, uniquely beautiful, ancient breed we all know different. Their gentleness begins before birth, it's inherent in their genetic makep-up. Wanda Mae, the curious cow checking out what Mike's up to, isn't the norm in any cow herd, and she's been human-friendly since the day she arrived, as are her calves. It's a very HERITABLE trait. Every scientific research report that one comes upon points to the fact that the calmer the feeder calf the better the carcass. One day it will be realized that when a commerical cattleman puts a British White Bull on his herd his calves are calmer, their growth is superior, and their carcass brings to them a premium over Black Angus, a highly volatile breed. The DNA testing accomplished to date indicates the British White breed tests as well as as the much more aggressive and temperamental black Angus breed in terms of marbling and tenderness. As DNA testing via GeneStar and/or Igenity progresses and is reported to and compiled by the BWCAA and members, I fully expect the results to continue to be superior and to further establish British White cattle as THE Beef Breed of the Future for genetic Tenderness combined with genetic Docility -- a combination no other breed can match -- and a combination that the Commercial Feedlot operator will not ignore and will demand from commerical cattlemen. Numerous articles are to be found on the positive impact on carcass quality from docile feeder calves in the chute and the feedlot. I've not been spending enough time relaxing with a good book out on the porch for some time now......so my dog has been making good use of the chaise lounges lately. This is Buddy pictured here. Before the past few months, he would have jumped and run if I'd found him lounging on the chaise! But I haven't been staying on top of that lately, haven't been taking that leisure time myself so have begun to enjoy watching them through the window having a nice time on the porch enjoying the view. This was probably the frostiest morning we've had this fall, the pond in the picture has that eery, misty look that comes with the new cold weather. You can't quite see the mist, but you can get the idea. Well, I didn't snap any new photos today, didn't even take nearly enough time to enjoy the pretty day outside. This new blog thing captured all my time, the HTML somehow got skewed up in and it wasn't posting with proper alignment or column width. I've been working with these blog pages for a few weeks now and trying to get things worked out and workable before making them public. I've kept this blog available for open comments, but today I got one of those SPAM posts with quite undesirable language and links. So, if you'd like to comment, for now just make your comment and it will come to my email and I'll permission it to post. I don't plan to edit or refuse any legit posts of opinions, questions, etc.. in regard to the British White Cattle breed. And feel free to use the Anymous post option until you're comfortable doing this! I've also had to rework the General British White Cattle Blog page in the LINK box to the right, lots of cutting and pasting to recover and consolidate posts and transition it from it's old blogspot location and also overcome alignment issues. I hope it's all in a permanent workable mode, even that atom.xml thingy is working now! The only thing left is the Home Page link on both pages, but I just dont' know if I'm going to worry with that any time soon. I'd really love to see our BWCAA members sign up to be CONTRIBUTORS to that forum and share their stories and photos with others and hopefully reach a more satsisfying level of communication and sharing amongst us all. Signing up as a Contributor is pretty painless, really very easy. Just send me your email address and I'll have an invitation to Contribute sent out to you. I may put together an email list of you all and get them sent out - but in the meantime, just ask me! I really like this shot from this past summer, we were very fortunate here in Deep East Texas to get ample rainfall until about September. In my memory, September is supposed to always be a month for rains in East Texas, but I think it's just significant events I recall in many Septembers that had rain in the background. Maybe I'll get a good shot of these same calves this morning, it's a crisp and clear day. Consider this.....with the price of beef skyrocketing at the market these days, and the healthful quality of that beef very questionable.....isn't it time to seek out healthy natural grassfed beef straight from the producer? Buying a whole beef is maybe too much too handle, but you can find a friend to take a side of beef and you the other, about 300 or so pounds of beef you'd need to find space in the freezer for. If you buy straight from a Grassfed producer you would pay from $1 to $1.50 a pound live weight of the steer, you'd then pay the processor about .40 cents a pound for actual carcass weight to cut and wrap it the way you want them to. Average cost per pound of beef for your family just dropped tremendously, and you're providing yourself and your children with the best of nutrition..........you won't worry so much if their diet is nothing but hamburgers.....it will be hamburgers providing optimal Fatty Acids, CLA's, Vitamin E, Vitamin A......and more. Put fresh beef in the freezer and you'll never shop for grocery store beef again. Guaranteed. Put Grassfed beef in the freezer and you won't have to worry so much about the fat in that delicious ribeye, it will be heart healthy fat you can enjoy. Consider the economics of buying a Grassfed steer straight from a producer. Too many people don't realize that it is still done today, and not just in rural America. Many grassfed beef producers will arrange to ship your beef to you in the city. These days, buying just a few cuts or packages from Grassfed Beef Suppliers can cost a bundle over what beef costs at the grocery store or supermarket. You can avoid all that by contacting a beef producer direct and they'll have a beef animal transported to a harvest facility nearby and then you tell the harvest facility how long you want it aged and how you want it processed. If you want 2 inch ribeyes, they will cut you two inch ribeyes. If you don't want a lot of roasts, well they'll just make those cuts into your ground beef instead. The price is the same per pound no matter what you decide. And the cost of processing is on the actual beef carcass poundage processed and packaged for you. If you are on a budget, it's worth saving to pay for the steer and the processing. It really puts money in the bank in the long run. Not to mention the better eating quality of the beef and the superior nutrition of the beef that will be in your freezer.....and not at an overpriced Walmart that injects their meat with.......wierd stuff. Ask for British White Grassfed Beef, ask for true Grassfed Fed, no corn and no emergency byproducts to get through the winter. A steer with superior grassfed genetics will thrive on grass hay and high quality Alfalfa Hay as a supplement. Always ask what they're eating, and don't presume they haven't received antibiotics or hormone implants or long periods of grain supplement, you need to ask and if possible visit the farm or ranch that you're considering buying from direct. Also to keep in mind......look for grassfed beef producers who focus their breeding programs on moderate sized animals -- you'll never have an optimum grassfed eating experience from a steer whose sire is over 1600 pounds and his dam who weighs more than 1200 pounds......the little guy just can't reach finish condition on grass until he's pushing 30 months old, and you won't realize the optimal healthy...and TASTY... finish of grassfed beef. Be sure and take a look at the Hemmings' article! . . . . look for it in the link box to the right. I have a particular interest in one day seeing clarity and consistency and most of all accuracy in the presentation of the history of the British White breed. For much too long, too many people have looked the other way out of perhaps deference, or fear or distaste of confrontation. Upsetting the status quo in Britain that the Park Cattle Society attempts to preserve in regards to ancient horned White Park cattle -- a status quo maintained through rhetoric long disproved as false, seems a real no-no. Most anyone can do a good Google search and find out just how far back in history the polled bovines of the world are found via archeological records. And most anyone can look at a Chillingham White Park photo and realize those ugly horned beasts are the product of years of inbreeding. Inbreeding begins to intensify recessive genes, whether in animals or man. The red points in British White cattle are a recessive gene, you can breed for it, or you can breed around it. Myself, I keep hoping to have a red pointed calf born on my ranch, I find them fascinating. Note in the old image above the presence of both a red point cow and a black point. Keep that in mind when you read the Hemmings article. It's my opinion that the British White breed is 'British' only in the sense that it roamed the British Isles well before the character of Britain was changed through invasions of a motley assortment of cultures. It is thanks to the ancient Celtic culture of Britain (Ireland, Scotland, and Wales) that we find our much beloved cows magified and revered in old myths and laws. How about......Celtic White Park, or Celtic Whites, or British Parks, or .....Fairy Whites! I can't say I comprehend why their breed name of old was ever changed. 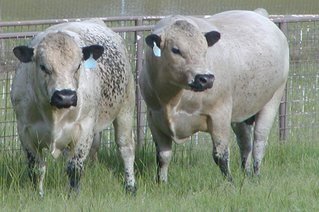 Many breeds have both polled and horned varieties. I wonder at times what it is we simply aren't told about the decision back so long ago in the 40's that resulted in the breed name British White. To presume it's because other carefully selected breeds were brought in to assist in breeding up and thus preserving the polled White Park, is to realize a level of competitive strife existing in the 40's that was succumbed to by the polled White Park breeders of that generation. 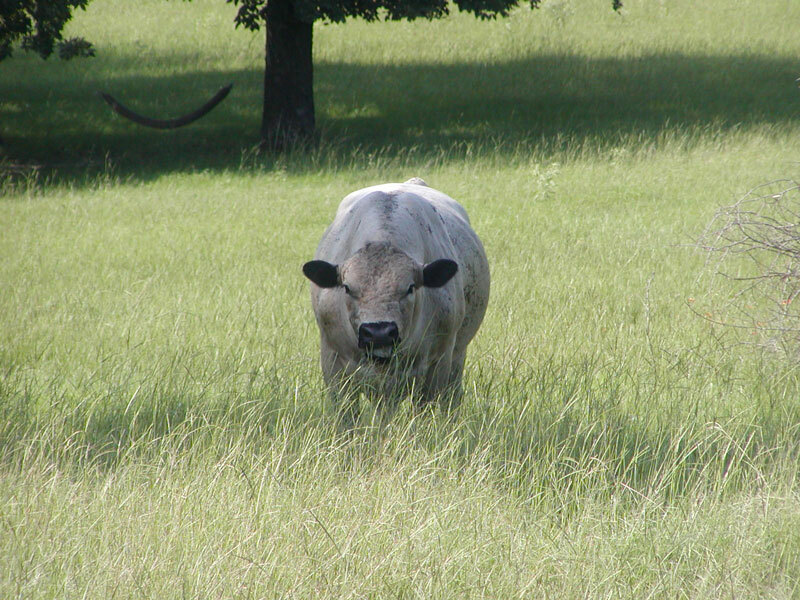 To presume that the horned White Park wasn't subjected to/assisted by the same machinations to preserve and increase their numbers is pure stupidity, and I wouldn't at all be surprised to learn that both polled and horned White Park cattle were in mixed herds in the early 20th century as well as in the thousands of years prior. Certainly, there was no distinction made of the small herd shipped to the USA prior to the onset of WWII that became the forebears of British White cattle today in the USA. Further, despite that "wild" claim, one only has to look at the photos of horned White Park cattle in Britain today and see their gentle contentment.....so what gives? Why the BS from the Park Cattle folks that their is no genetic connection between the horned White Park and the British White? We have Jessica Hemmings to thank for laying their cited genetic testing to bed, permanently. Is it only the Americans who delve into and analyze the rhetoric of the Park Cattle Society? Are we just terribly gauche? Won't let things just lye (or lie)? Or is there some critical bit of non-public information that is kept in the UK fold? I just don't know. Regardless, we British White breeders in the USA and Australia are proud of our cattle, work hard to promote our cattle, and are sick and tired of seeing them referred to as those 'Whites' in misguided articles. In America we constantly have to correct and attempt to educate interested folks about our cattle. Countless times we have to say "No, they aren't Charolais?sp" crosses!" In my part of the USA, and in most others, Charolais cattle are considered white, and they are a very popular and dominant breed. To my eye they are quite a dirty white color, but that doesn't matter much. We have to think about the general public opinion, attitude, and education level. Despite, or perhaps because of, this background and confusion, our cattle also provide to us and to the consumer, an excellent beef product. It is not without reason that the 'Sirloin' is said to have been deemed thus whilst a King dined on a loin of British White beef. I forget where I ran across that bit of information, and it could well be trivia, perhaps someone reading this can comment on that. We've had some very nice cool days here in Southeast Texas, a lot earlier than last year, or at least as best I can recall. This morning the sky is clear and the sun is very bright. The trees began changing their leaves a couple of weeks back. The hickory trees change first around here and they seem to be a much stronger orange than ever before - you can see one in the tree line sort of shouting out it's color! Research proves again and again that feeder calves that are calmer in the feedlot and in the chute will likewise produce a more tender carcass. The British White breed is inherently docile -- the calves exhibit their unique nature at birth and onward. This docility is very heritable and is distinctively present in most first cross calves.